As the number of ethnic Rohingya Muslims fleeing Myanmar hits record levels, the prospects for a lasting settlement of the crisis in Myanmar's Rakhine State look bleak. "We have been monitoring these exits for years, and this is the most we had ever seen," she said, adding that in late October up to 900 left in a single day. Lewa attributes the surge to multiple factors. "The last sailing season [period of calm water for boat departures] was just before the census, and many of them felt confident because the government had promised they could self-identify as Rohingya," she said. "Then the rains started, the census didn't count them, and they settled into another wet summer in the camps." "We are caged like animals here," Muhammad Uslan, who has lived in a camp outside Sittwe (Rakhine State's capital) since July 2012, told IRIN. "We cannot work or go to the town to buy things. Our young people grow up knowing they will never be able to go to university." Rakhine Buddhists, much like Myanmar's other ethnic minorities, feel marginalized by a history of restrictions imposed by the central ethnic Burman government, which ruled with an iron fist until reforms began in 2010. According to an October 2014 report by the International Crisis Group (ICG), "decades of Rakhine [Buddhist] anger at their treatment at the hands of Burman-dominated regime have not gone away - but they have begun to morph." Much of the ethnic Rakhine anxiety as they assert themselves in increasingly open political space, has been directed at the minority ethnic Rohingya. The most recent bulletin from the UN Office for the Coordination of Humanitarian Affairs (OCHA) said access to health care for those in the camps remains a "major challenge", and the UN World Food Programmed announced in October that without US$37 million more in assistance, rice distribution in the camps, where nearly all residents rely on food aid, would be interrupted from December onwards. However, analysts caution, humanitarian action is only one part of the solution. According to ICG, "ultimately, ways must be found to ease [Buddhist] Rakhine fears, while protecting the rights of Muslim communities." However, the report warned, "any plan that meets international concerns may not be able to satisfy local demands." An October 2014 report by the Washington-based Center for Strategic and International Studies (CSIS) says the Myanmar government "has abdicated its leadership responsibilities, passively standing on the sidelines" as aid workers fled in March 2014 after Buddhist mobs targeted their offices. However, ICG cautioned: "The situation in Rakhine State should not be seen as a simple humanitarian emergency." According to ICG, "a humanitarian response is essential, but such interventions are only one component of addressing a situation to which there are no easy solutions and which is likely to take many years to resolve in an effective and sustainable way." Stephen Morrison, senior vice-president at CSIS and co-author of their report explained: "It is an exceptionally treacherous territory. There is no simple short-term answer." According to Morrison, interventions in Rakhine State need to "address the legitimate dire needs of the Rohingya and the legitimate sense of marginality of the host [Buddhist Rakhine] community." Economic issues and demography underlie the tensions. 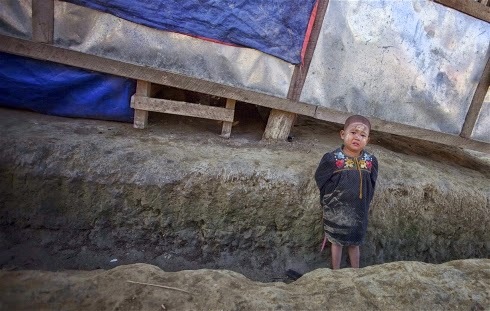 Rakhine State is Myanmar's second poorest region: a popular Rakhine Buddhist fear is that Muslims are pouring over the border from Bangladesh (which currently hosts up to 500,000 Rohingyas who have fled Myanmar) and that they might soon become a majority in the state. Tufts University economist David Dapice said the facts do not suggest this fear is warranted: "Levels of living in Bangladesh, even among the bottom quarter, are better than the average levels in Rakhine and more Bangladeshi kids are healthy, go to school, and get clean water or electricity. Would you move to a place to be worse off?" However, assuaging this fear might prove more complicated than analysing it. ICG confirmed the lack of evidence about a Bangladeshi influx, but explained: "What is most important to recognize is the political reality of these strong demographic fears in Rakhine communities." Segregation, whether through camps or by restricting movement in majority-Muslim villages, has not been good for the economy. As the internment of Muslims stretched into its first year in 2013, food security indicators across the state dropped. ICG found that some Rakhine business leaders "decry the segregation of Muslims as economic folly". However, in a September 2014 paper, Dapice explained: "Not all Rakhine people realize how important the Muslim workforce was for the local economy. Now that many [Muslims] are confined to camps or fearful of leaving their villages, wages have risen sharply and some land is not even being farmed due to shortages of labor." Aid agencies have called in recent months for increased economic development,including infrastructure to attract investment. But the UK-based corporate risk analysis firm Maplecroft warned in October 2014 of "potential disruption companies face if they are perceived to support minorities," including by hiring foreigners or Muslims. The Arakan Project's Lewa cautions that aid should be delivered based on need, and not a tool for negotiations: "Using aid projects to negotiate peace with the Rakhines would be a disaster. At the first instance, it's a reward for horrible behavior." ICG agrees, and further warns that development could also unintentionally appear to make underlying fears come true: "There is also great concern that an economically prosperous Rakhine State. could attract significant numbers of illegal economic migrants from neighbouring Bangladesh, creating further demographic pressure on the Rakhine." The Myanmar government has made some moves that suggest increased attention to the Rakhine crisis. In June, a high-ranking general was appointed the state's chief minister. In October, the government jailed seven men who were involved in lynching 10 Muslims during the June 2012 riots. However, a leaked draft of the Rakhine Action Plan, which was meant to chart stability in the state, sparked criticism. Human Rights Watch said it was "nothing less than a blueprint for permanent segregation and statelessness that appears designed to strip the Rohingya of hope and force them to flee the country." The first phase of the plan, a pilot citizenship verification programme, ran for several months in an area where a large number of Muslim respondents in the 2014 census agreed to be registered as "Bengali" (instead of "Rohingya" - a term the government, and most Rakhines, reject). However, in October the programme was suspended, reportedly because Rakhine Buddhists had criticized the very notion of some interned Muslims becoming citizens. Meanwhile, the government of Myanmar is pushing back strongly on international human rights criticism - including by mentioning the Rakhine crisis and, although not by name, the Rohingya identity question. U Wunna Maung Lwin, Myanmar's foreign minister, addressing the UN General Assembly on 29 September, said: "Myanmar should no longer remain on the agendas of the Human Rights Council and The Third Committee of the UN General Assembly." Speaking on Rakhine at the Third Committee meeting on 30 October, Myanmar's representative to the UN, U Kyaw Tin, said: "The right of self-identification. should not be at the cost of placing obstacles to finding a durable solution to this issue." In advance of the Association of Southeast Asian Nations summit in Myanmar on 12-14 November, US president Barack Obama phoned the Burmese reformist president, Thein Sein. The US government record of the conversation mentioned "Rohingya"; the Myanmar government's did not. Development actors in-country appear to be toeing a more cautious line. For example, the US Agency for International Development has begun designing Myanmar's first ever Demographic and Health Survey. While the majority of DHS questionnaires worldwide contain a question about ethnicity, the Myanmar DHS will not, USAID officials confirmed to IRIN, appearing to heed recommendations before the 2014 census to nix the ethnicity question altogether. Mohammed Uslan, who was moved to a Sittwe camp by police in 2012 under the guise of his own protection from further communal violence, argued: "The government doesn't need to ask the angry Rakhine people if we have rights as Rohingya. They need to govern all of the people like they are in charge."